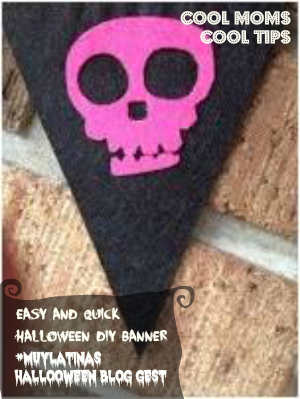 Here is a quick and easy Halloween decorative banner to make with the kids. 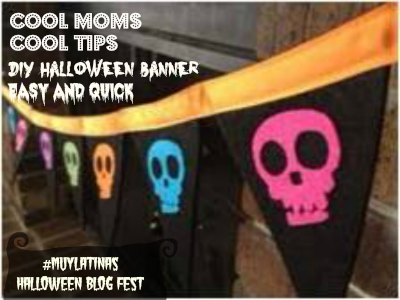 Honestly we saw a similar store bought banner and style the idea to make into a fun activity to work on with our munchkins. Then on each triangle we stuck our foam skulls. You can glue here any Halloween motif you desire. Get creative and spin each triangle to give it spooky character! Once our triangles were ready we laid the ribbon flat. Then we made a line of glue over it. Next step, was placing all 12 of our triangles over the ribbon and glue, making sure all the triangles touched each other at the base's angle or points. This left us with 5 cms of extra ribbon on each side to use as ties for easy installation. Our ribbon had stitches on it which gives out the impression it has a more elaborate fabrication, but you now know our secret! We left to dry, and voila! There is your banner ready to hang and decorate your entrance, foyer, mantle, walls, stairs etc. Will you try making this?